ABOVE: The Montmartre Funicular may be fun when it isn't crowded, but if you're reasonably fit, you can save the price of a ticket by climbing the 36-meter or 118-foot stairway to Sacré-Coeur. Paris is more walkable than many tourists realize: When we stay in Montmartre, it takes us only about 40 minutes to reach the Seine on foot, despite having to walk nearly halfway across the city from north to south. In the heart of Paris, distances are even shorter. For example, the entire length of the Champs-Élysées is only 1.9 km or 1.2 miles, and the distance between two of the city's top tourist attractions--Notre Dame Cathedral and the Louvre Museum--is considerably less than that. The trek from Notre Dame to the Eiffel Tower is longer (about 2.5 km, or 1.6 miles), but it's an easy stroll along the Seine unless you have mobility problems or the weather is awful. Métro trains run everywhere (no place in Paris is more than 500m from a station), but there's no logical order to the lines. Getting from Point A to Point B often requires a train change, even if you're going a relatively short distance. Unless you're traveling a long way or making a simple journey (along Line 1, for example, which mostly parallels the Seine), it may be faster and easier to walk. RER trains are quick, and the RER network map is easy to figure out. However, trains run less frequently than Métro trains do, and connections between RER and Métro lines sometimes require long, time-consuming walks underground. Public buses crisscross the city, but unless you know your landmarks, it can be difficult to know when to get off--especially if the bus is crowded and you have a poor view of your surroundings. 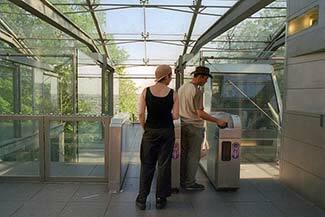 If you do plan to use public transportation extensively, the Paris Visite travel card may be worth considering. It's valid for 1, 2, 3, or 5 days, and it covers public transportation in zones 1-3 or all zones, depending on which version you buy. (Zones 1-3 cover the city and its immediate outskirts; zones 4-5 include CDG Airport and suburban destinations such as Disneyland Paris, Versailles, and Fontainebleau. Another transportation option is the "hop on, hop off" sightseeing bus. Two companies, L'Opentour and Big Bus Tours, operate these double-deck buses, with slightly different routes. Fares aren't cheap, but if you're traveling mostly between popular tourist spots and don't like walking, a one- or two-day sightseeing-bus pass will be less expensive than hiring taxis. See our Paris Sightseeing Buses article for information on these two companies plus the Batobus, a water bus that connects museums and tourist attractions along the Seine. Top photo copyright © Paris Tourist Office. Photographer: Amélie Dupont. 1st inset photo copyright © Majej Pribelsky. 4th inset photo copyright © Patrick Breig.